Deming was one of the best of the American Western sculptors from the early 20th century. His works are rare and hard to find. He sculpted many small American animals, especially bears at play. But he also did several fine models of American Indians in their every day life. 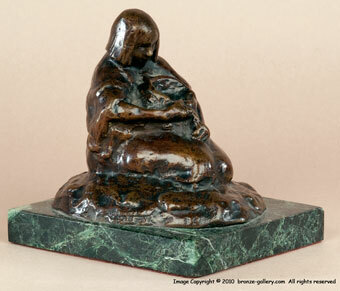 This fine bronze shows an Indian girl sitting with a basket held in her arms. She wears a shawl over her shoulders and is sitting on the ground cradling the basket, perhaps she is preparing corn for a meal. Deming's Indian subjects are sensitively portrayed in scenes of their daily life. This Indian girl has a quiet dignity much like Charlie Russell showed in his Indian women. She is well cast with good detail, a rich dark brown patina and she is mounted on a green marble base that is 5 1/2 inches long by 4 3/4 inches wide. 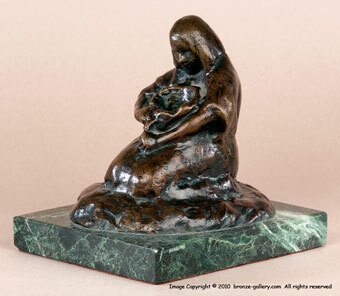 This bronze was cast by the Deming family and is marked E.W.D. Estate. A very fine Western bronze by one of the best of the early sculptors working at the turn of the 19th century.